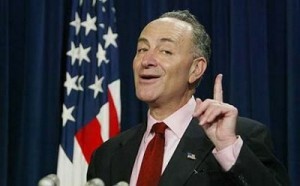 Chuck Schumer is the consummate politician. He knows how to play the system. He deals with inside the box, he is pragmatic. Single payer doesn’t have a prayer in Congress and so he isn’t going to expend capitol on changing that. In some ways he is better than someone say like John Hall, who likes to argue that he is progressive and fails to vote because he is worried about the poltiical backlash. I always prefer politicians who speak their version of truth rather than lead us on to think they are our friends who will do what we want. Someone like Schumer would argue that it is our job as activists to change the political support among voters for single payer that makes it then possible for single payer to win. The argument of course is when does someone like Schumer step up to the plate to give us the support that enables single payer to become mainstream. Schumer’s staff says that they will try to improve the waiver so that states can do single payer. I am disappointed that this issue seems to have been dropped by so many advocates and national groups since to me it remains the most likely path to single payer in the US. The problem is that most of us enable politicians like Schumer – because most of us vote for Democrats, despite more than a century of history of Democrats failure to support movements like single payer. Actually, it is more of question that the Democrats always betray social movements at the big decision making time, over and over and over again. How many of us voted and campaigned for Dr. Joel Kovel, a long time single payer advocate, when he challenged Schumer and D’Amato for US Senate? The problem of course is that Joel got about 1% of the vote and wasn’t it better to defeat D’Amato than waste our vote on Joel? How in the world did only 55,000 peace and health care and labor and environmental advocates in NYS manage to cast a vote for Howie Hawkins when he recently ran for US Senae against Clinton, who was all but assured of winning as she stood against everything that progressives in NY wanted? As long as liberals and progressives continue to support the Democrats as the lesser of two evils evil will always prevail. At some point we have to be willing to have the courage of our convinctions and focus on the long path not the short term results. The failure of the single payer movement is merely a reflection of the larger failure of social change in this country, whether it is climate change or peace or health care or labor issues. Most of us agree that the solution involves grassroots organizing. I know I have been trying to do that every day since I was 18 years old when I started a group called NYPIRG, then became a Head Organizer for ACORN, then spent 24 years with Hunger Action Network. Easier said then done. And trying to get labor and peace activists and health care advocates and women’s groups etc. to work together in a democratic fashion is very difficult.We all think our issue is most important, and few of us have been willing to focus on changing the system rather than trying to win our issue. I also have worked most of that time supporting third party independent electoral action, something I learned from my work with ACORN (which now largely runs the Working Families Party). One of the reasons I left NYPIRG for ACORN was that I saw how futile it ultimately was to lobby legislators bought with campaign contributions for special interests to change the system against the interests of their campaign contributors. The situation has only gotten worse, much worse, over the last 30 years. I joined ACORN because it was the best community organizing group in the country. A title it still probably holds 30 years later. They organize the grassroots 7 days a week, 52 days a year, at least 12 hours a day. They walk the walk. But ACORN – like all the Alinsky groups – is largely unable to work in real coalition with other progressive forces for very real reasons that goes to the heart of their organizing philosophy. And ultimately their organizing strategy is so dependent upon having full time organizers that have real world limits on the number of people they can organize as once that it is impossible to conceive of how they could ever have enough organizers to be successful. I wrote my novel Madame President: The Unauthorized Biography of the First Green Party President to explain green policies (no, we are not dissastified Democrats, who are much closer to the Republicans than to the Greens.). But I also came to the conclusion that progressive change is the US would require two things: one, a strong grassroots movement; and, two, a strong charismatic leader to lead the grassroots movement, enabling it to overcome its seemly inherent inability to work together in a democratic manner. The last point was most controversial but unfortunately, I have concluded it is essential. In my lifetime the person who came closest to uniting the left was Jesse Jackson. He fell short for many reasons, including of course the problem all movements face in trying to challenge the power structure. He was able to get most of the left to overcome their incessant internal bickering. But he was unwilling to be accountable to the larger grassroots movement (one needs both to work in tandem, not just have a leader to follow) and unfortunately his main goal was his own election rather than the movement. If the single payer movement is to succeed, it will need a broader analysis of how to do social welfare. Just saying that we are going to point out that single payer is the only solution isn’t going to succeed. The path to success must include breaking with the Democratic Party (I would say forever, but it at least needs to do it initially so that the threat is credible). The defeat of single payer highlights all that is wrong with our political system, with the Democrats, and with our own movement and that of other social change movements. All those problems must be addressed.